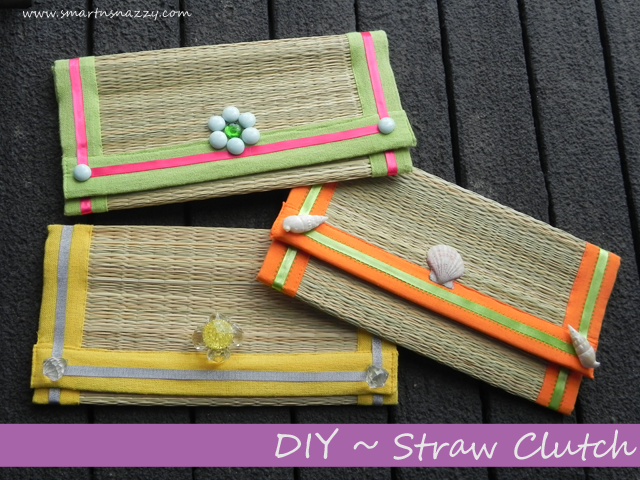 Smart n Snazzy: DIY ~ Straw Clutch + Giveaway! Fold the purse in roughly thirds, so the top flap doesn't quite go to the bottom. But again, you can customize this any way you want. Use the embroidery thread to sew up the side. I knotted it, and insert it into the bottom corner of the clutch so the knot is hidden inside. Don't sew through the little inside top flap; instead knot the floss and trim the excess. Repeat on the other side. Here's what yours should look like. Now it's time to attach the magnetic closures! It's easiest to slide the prongs through in between the straw pieces. I firmly attached the top closure, then used it to determine where the bottom (inside) one would go. Then I attached it as well. You should be able to use just your fingers to fold the prongs, but if not use some pliers. And now this is what you've got. The clutch is fully constructed, but we need to hide the stitches and the magnetic closure's exposed underside. I used fabric glue to affix a contrasting color ribbon over the stitches. I then decided to continue the ribbon over the inside flap and on the outside front as well to spruce it up! Let it dry, then use your hot glue gun to attach gems, stones, shells, flowers, whatever suits your fancy! For this one I used some glass tile gems. This is so fun and great for everyday. I gave this one a casual beachy vibe with some seashells. And this one is the 'glam' one, with metallic ribbon and diamond shaped gems (floral vase fillers). The best thing here is that I only paid the $3 for the three placemats; everything else I had on hand in my craft stash! They're the perfect size to hold your essentials, and the straw will give as you use it more so it won't be so snug inside. Leave a comment with your email and let me know which is your favorite, and I'll randomly pick a winner next Friday (April 26th) and send them their choice! Ohhh tooo cute! Woohoo dollar tree! Those are so cute, I am going to start looking at placemats differently. The yellow onw is my favorite.